Biche is a destructive sludge metal band from Reims. These sludge lords make a distinct breed of metal which reeks of Dark Castle and Amenra with more than a few touches of Thou in their for good measure. The end result is an encapsulating and powerful sound that will slowly melt your face off under the incredible and enduring power of pvre sludge metal. The harsh cries that permeate this record are distinctly appealing and showcase the magic of good old fashioned doom metal. The dark yells and sheer desperation found throughout this record is strangely beautiful. In many ways it is perfectly reflected by the bleak nature of the art, I really can think of no better depiction of the unyielding soundscapes painted by Biche than an image of Bambi having his head blown off. 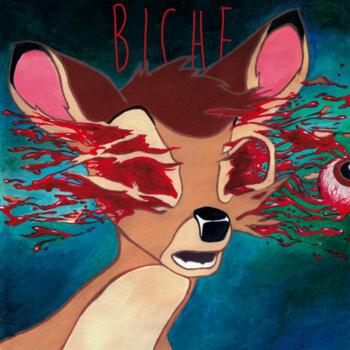 Their self titled EP Biche is an incredible debut and I am very much looking forward to what else this evil minded duo can pump out in the future!